LED-projection platform Lightpack hopes to bring cinema-style lighting to the average consumer. Russian programmers have developed a lighting system for monitors and TV screens that enhances the viewer's immersive experience, but doesn’t require any special knowledge to set up. 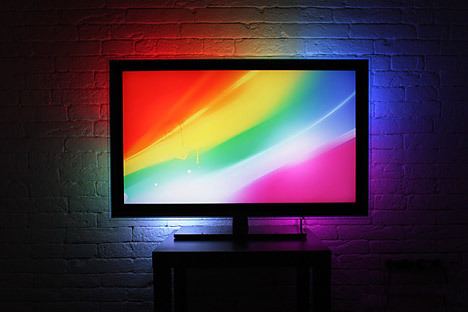 Their startup, Lightpack, controls the output of an LED array that illuminates the wall behind a television or monitor with the same colors that are on the screen. According to the developers, Lightpack is in all ways superior to Ambilight, a similar system from Philips. Lightpack consists of a small box that is connected to an LED array. It attaches to a computer or television via USB cable and is compatible with systems running Windows, Linux and Apple OS X. The developers say it should take the average person 10-15 minutes to install and set up. The programmers brought their product to market after raising $500,000 from potential buyers though the crowdfunding platform Kickstarter. When the Lightpack entrepreneurs first decided to launch the mass production of their device, several U.S. firms were already trying to sell LED-illumination devices to owners of home cinemas and other gadget enthusiasts, but none of them was interested in entering the mass market. Now,however, the company has several competitors – many of which are using Lightpack’s own instructions and sourcecode, which are open. But none of these competitors have totally replicated the Lightpack. For example, Bravekit, a Ukrainian company, sells a version of the Lightpack, but it can be connected by USB cable only to computer displays or notebooks, not televisions. Pavel Krivoruchko, the CEO of the Lilium development studio, says that the open source model is not helpful for a young company like Lightpack that does not have a strong brand. “I think the company should either move to a model for licensing the technology to third parties or try to sell its solution to vendors for delivery in packages for TV sets and related devices. The main sales channel for Lightpack continues to be its website. The startup is in talks with several major suppliers in the United States and China that are planning to put Lightpack on the shelves of electronics shops and sell it via online stores. Lightpack's founders will sell the devices to their partners at a wholesale discount, while the price for consumers may remain the same or increase at the discretion of retailers. Lightpack is planning to sell at least 110,000 devices through all channels in 2014. The founders are planning to continue developing the product to improve its software and hardware over the next few years. A new version of the device will be designed for TV viewers who are not active computer users. For the near future, the founders expect to reinvest the startup's revenues in the continuing development of the product. According to rough estimates, the company has earned more than $1 million since the product went on the market. Another possible source of investment is foreign funds that are already engaged in hardware projects. First published in Russian at RBC Daily.